Discover an experience resting somewhere between the pages of history and the wonder of myth and legend at the 27th Annual Florida Renaissance Festival, a short drive from our hotel. Hundreds of craftspeople and artists will gather to showcase their glass, wood, metal, and artwork, along with a vast collection of performers fighting, jousting, and singing for your entertainment in 16th Century style. This event is fun for the whole family and people of all ages. 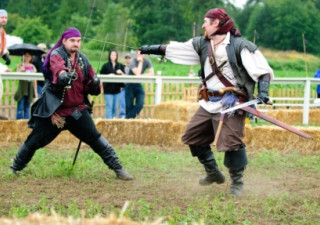 Find your connection to the renaissance era with specialty reenactments including the H.M. Royal Artillery (serving the King, of course), catapult demonstrations, chivalry fights, and the court of the Ottoman Empire. There are even Viking Invasion reenactments so that you may peer into the past and see history in action. The festival is open from 10:00 a.m. to dusk every weekend starting February 9th to March 24th. Come as you are or in your favorite steampunk or renaissance garb, but be sure not to miss the festival of the season. For more details or to order tickets please visit their website.